Newly released Battle Pet Equipment has greatly improved Battle Pet’s power. 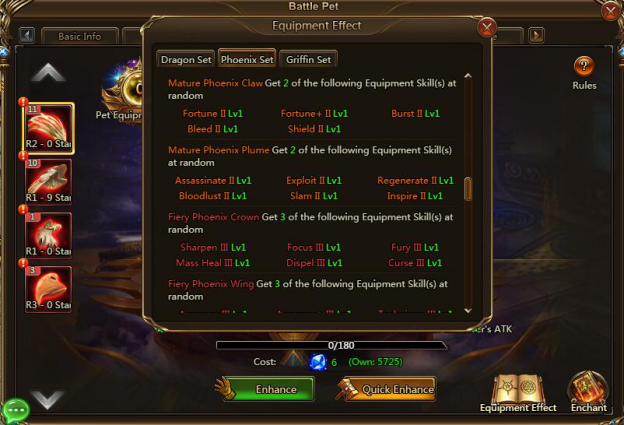 All Battle Pets share one set of pet equipment and the equipment attributes are added to all your pets. Equipment skills take effect on deployed pets. 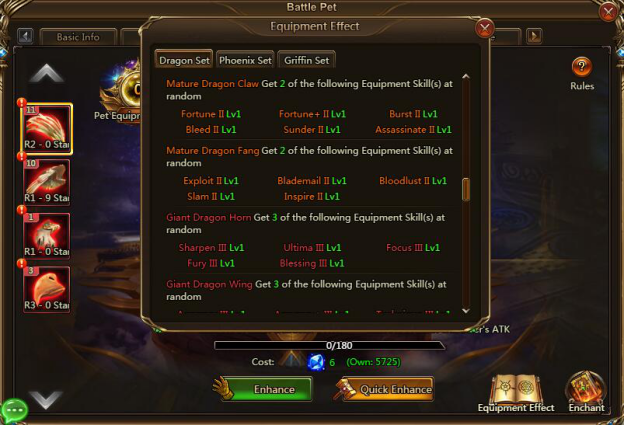 There are three sets of pet equipment, namely Dragon Set, Phoenix Set and Griffin Set. Each set has its own attribute orientation and equipment skill. There are five grade of each set’s quality (Epic, Legendary, Mythic, Celestial). The higher the equipment quality is, the better its attributes and more skills will have. Equipment quality will not affect the Equipment Set Bonus. As long as the two or four parts are of the same set, the Set Bonus (2-piece or 4-piece) can be activated. There are so many pet equipment that it’s hard for warriors to choose. Now let’s analyze pet equipment from different sets. 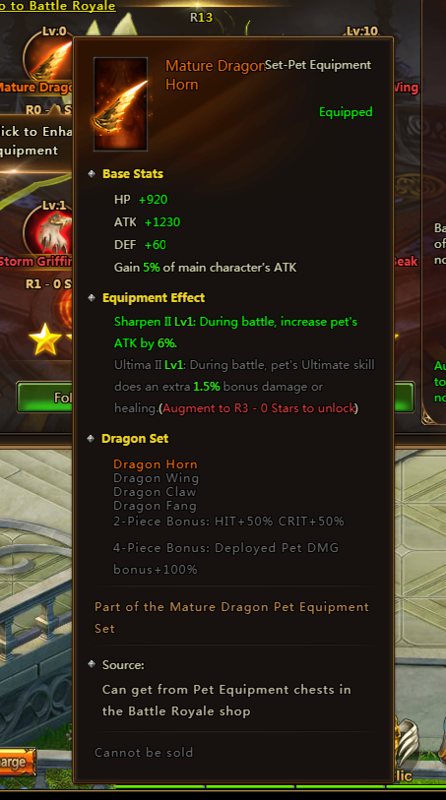 Dragon Set’s attributes and skills are more offensive. It enables battle pets to gain great Hit, DMG bonus and Crit attributes which greatly improves pets’ ability to deal damage. This set is recommended for damage-dealing battle pet. In terms of attributes, warriors need to ensure your pet skill can effectively hit the target. Therefore Hit attribute should take the priority. 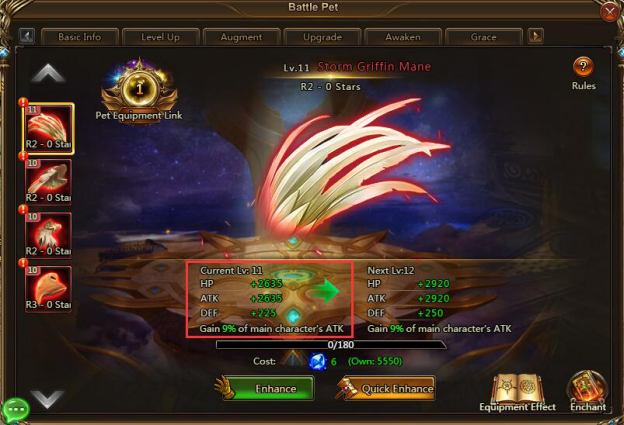 Secondly, based on your pet’s attributes, you can choose from attributes like DMG, ATK, Crit, Crit rate bonus, Rage increasing bonus and etc. Many skills of Dragon set needs Crit to trigger, so when using this set warriors need to accumulate enough Crit to make it exercise the best effect. Phoenix Set’s attributes and skills are more defensive. It offers great Healing bonus, and has HP restore and Shield skills, which can protect the deployed heroes. This set is recommended for battle pet that has one or two healing skills. In terms of attributes, Shield, Dispel, Mend should take the priority. They provide battle pets with extra effect and can protect your main force or hero with the lowest HP. Secondly, Agility is important too. High Agility can ensure your pet can take action earlier, and thus heal your ally with low HP, which can effectively avoid your ally being killed by your enemy. Besides, ATK, Crit rate and etc can help improve healing effect, so warriors should also take these attributes into consideration. 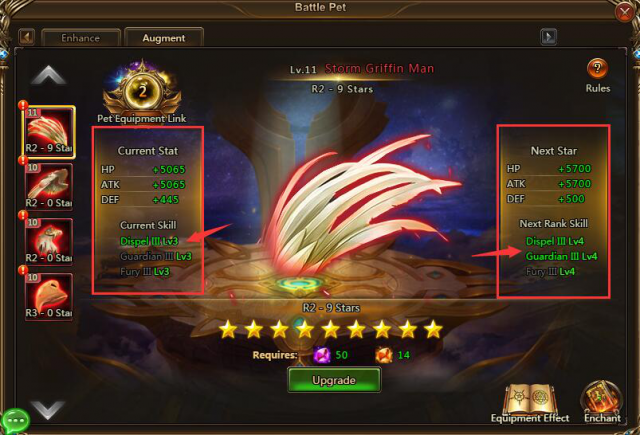 Attributes like Crit, DMG cannot bring extra bonus for pets with two healing skills, so they should not take the priority. Griffin Set’s attributes and skills are more assistive. Its skill can bring great buff for the deployed heroes, apply debuff on the enemy, and increase the trigger chance of equipment skill. This set is recommended for assistive battle pet. In terms of attributes, skills that can bring great buff for the deployed heroes and apply debuff on the enemy should take the priority, such as Blessing, Guardian, Dispel, Curse and etc. DMG, Crit, Heal and etc take lower precedence. This shows that, when each set’s 2 pieces or 4 pieces are available, an extra attribute bonus can be activated, and 4-piece bonus is much better than 2-piece bonus. Except for very few battle pet and skill formation, 4-piece bonus of the same set is better than two 2-piece bonuses of two different sets. 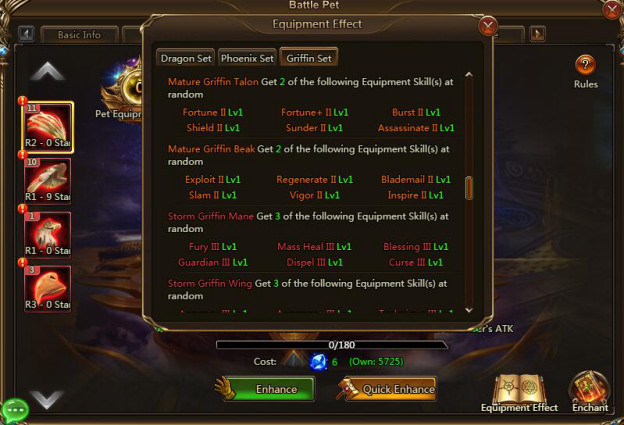 When cultivating pet equipment, warriors should collect whole set equipment first, and avoid mix and match sets. This way you can gain more benefits from the pet equipment. 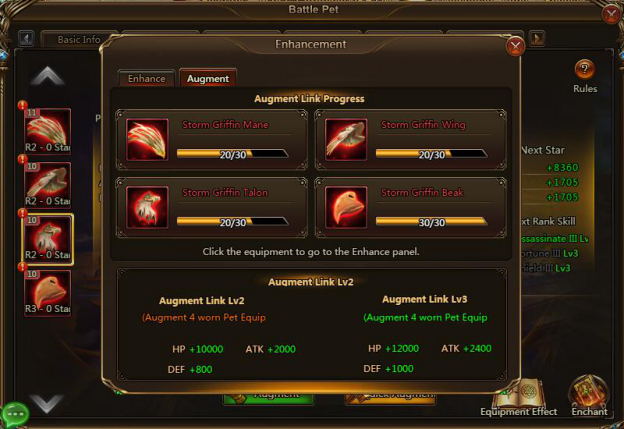 Enhance pet equipment can not only improve equipment attributes, but also gain extra special attributes such as gaining main character’s ATK or Hit and etc. This means battle pet can gain more benefits from main character’s cultivation. 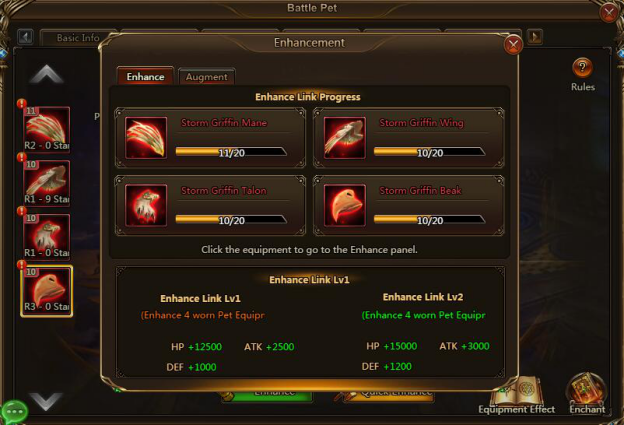 Since material consumption for enhancing increases as the enhance level raises, the enhance link can provide massive attribute bonus which levels up when all parts of the set’s enhancement increase every 10 level, warriors needs to cultivate each part equally so as to gain the enhance link bonus. Augment can not only provide extra attributes but also strengthen equipment skill. Firstly, when pet equipment that can have more than one equipment skills reaches certain augment level, the skills can be unlocked. Besides, when the augment rank rises, equipment skill level will be raised too which can make the trigger chance higher and skill effect stronger. It is same as the enhance cultivation. Since material consumption for augment increases as the augment level raises, warriors needs to cultivate each part of the equipment set equally so as to gain the augment link bonus. Last：Strategies on Minion System Coming from Our Players!